SRINAGAR: In order to have higher access to national and global markets, experts here on Saturday asked entrepreneurs and industrialists of the Valley to use designing and branding as a tool to reach success. Experts shared their experiences and success stories during a daylong conference, ‘Mixin-Design+ Brand +Business Talks’, held at SKICC here on Saturday. 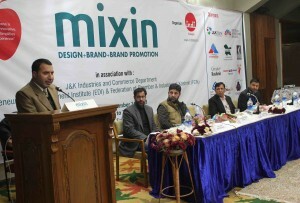 Conference was organized by Srinagar chapter of INDI Design, a global brand, design and innovation consultancy, in association with J&K Industries and Commerce Department, EDI and Federation of Chamber and Industries of Kashmir. Highlighting importance of Brand, Sudhir Sharma, CEO, INDI Design, India, said that in order to maintain global standards and meet customer expectations, brand identity is must. “To strive in the market consistent use of varied design approach with simple language and pictographic displays is the most required thing in contemporary business standards,” Sharma said. He also said that brand image should necessarily strike to one of the five human senses and if it does not yields social and economic benefits then it is total failure. Terming micro, small and medium enterprises (MSME) as the backbone of Indian industry sector, Shashank Mehta, Senior faculty, National Institute of Design, Ahmedabad, said that use of design in small industries has now become a necessity for the development of MSME. “Design provides a holistic understanding of the overall controlling factors of business, design protects and preserves the brand and increases the competitiveness of products,” said Mehta. Speaking about new approaches in packaging, Deepak Manchandra, Packaging Expert Firstouch, Delhi, urged entrepreneurs to utilise art and technology effectively while going for packaging process. “Packaging and design go hand-in-hand. A large number of brands have shown a significant development by effective packaging without proper advertising support,” Deepak said. In her welcome address, managing director, INDI Design, Srinagar, Uzma Showkat highlighted the importance of the conference being held in Kashmir valley. “Entrepreneurs and business people in Kashmir are reluctant to these kinds of innovations and experiences. The very aim of organising this conference is to make them aware about the need and importance of design for successful business,” Uzma said. “Mixin is a series of conferences designed to inspire budding entrepreneurs and local businesses to build their brands and take their businesses to greater heights. Commissioner-secretary Industries and Commerce Department, Farooq Faktoo and District Development Commissioner, Srinagar, Farooq Ahmad Shah, besides a number of young entrepreneurs, were also present at the occasion. INDI Design is an International Brand, Design & Innovation consultancy, based in Pune, India. INDI has partner offices in Mumbai, Delhi, Jaipur, Bikaner, Srinagar, Paris, Berlin and Riyadh. POOL magazine is a compact monthly design magazine for the design community and all others interested in the creative field. POOL presents a fresh, exciting idea pool by creating a unified platform for creative inspiration without any constraints on discipline or subject.